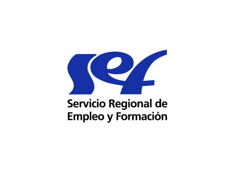 SEF is the Regional Training and Employment Service of the Region of Murcia, an autonomous body of administrative character, depending on the Educational and Labour Policy Administration, in charge of promoting, developing and enforcing the regional labour policy (Employment, Career Orientation and Training), counting with 25 offices distributed throughout the Region and the National Reference Centre of Chemistry for Vocational Education and Training. Therefore, its main aim is to join training policies with the ones directed to promote stable and quality employment. In this way, and through its arbitration and orientation activity, it will be guaranteed a greater efficiency when joining offer and demand in the regional work market; due to the immediacy that allows the direct contact with the realities and needs of the area, making possible to detect the more demanded profiles, and so, the promotion of training for these labour posts. Its activity is directed to facilitate workers an adequate and dignified post, to favour promotion and training at work, and to ensure equality between men and women at work. SEF unifies regional resources and services related to employment. It coordinates its activity with the rest of Public Administrations, and at the same time it constitutes itself as a vehicle of participation of social agents in the elaboration and design of strategies for employment and regional development. Passing of the Annual Plan of Training for Employment. Elaboration of Vocational and Occupational training programs. Development of the Training National Programs in the autonomous framework. Management of centres of vocational training. Planning, coordination and control of the formative actions of collaborating institutions. Informing on and spreading aspects related to the labour market and training offers. Grants and aids to take part in courses or training experiences. Planning and realization of training courses for unemployed people, workers, women, handicapped people or groups at risk of social exclusion. Planning of the Regional Plan of Employment. Management of Integrated Services for Employment. Information, orientation, assistance and support to integrated unemployed and employed groups to facilitate their labour insertion and occupational improvement. Programs of promotion of self-employment. Programs to create stable work among unemployed groups. Programs of employment workshops, vocational training centres. Management of the net of employment offices of the Region of Murcia. The integration in the net EURES (European website of professional mobility, which aim is to offer services to employees and businessmen, and to any citizen that may wish to benefit from the principle of free circulation of people. It involves three types of services: information, advising and contract/job). The Regional Training and Employment Service of the Region of Murcia (SEF), is in charge of promoting, developing and enforcing the regional labour policy: Employment, Career Orientation and Training. SEF spends over 32 million euro every year providing Vocational Education and Training (VET) both to improve the qualification and to increase the employability of unemployed people. SEF provides training for young people, unemployed and currents workers who want to progress in their careers by VET studies. The training provided is both broad and for all economic sectors. SEF not only provides training, also advice and orientation: 136 guidance counselors or advisers work full time at Career Orientation Department, for giving advice and career orientation to the unemployed through 25 employment offices distributed throughout the Region. SEF covers the training needs in short, medium and long term.